• Despite efficiency improvements, CO2 emissions from international shipping are projected to be two to five times higher in 2050 than in 1990. At the Paris climate conference, countries agreed to limit climate change to well below 2°C. Without considerable contributions of the shipping sector to global mitigation efforts, this goal will be much harder to achieve. • The main issue at stake at MEPC 72 is the adoption of the Initial IMO Strategy on reduction of greenhouse gas (GHG) emissions from ships. MEPC 72 will be preceded by a weeklong meeting of the GHG Working Group (ISWG GHG 3) that will discuss issues relating to the Initial Strategy with a view to agreeing upon and submitting a draft decision text for adoption at MEPC 72. • Other issues relevant to GHG reduction from international shipping include updates on the Energy Efficiency Design Index (EEDI) and the Data Collection System (DCS) as well as a agreeing on a Mandate for the Sub-Committee on Pollution Prevention and Response (PPR) to begin work on measures for reducing the risk of Heavy Fuel Oil (HFO) spills in the Arctic area. • It is recommended that the ENVI delegation uses opportunities such as bilateral meetings with delegations from other countries, informal conversations or the side events to discuss the importance of emission reductions in the maritime sector including the pros and cons of regional measures. Historical emissions from international maritime transport increased by 80% or 3.0% per year from 1990 to 2010 (IEA 2014). In comparison, the total global GHG emissions only rose by 1.1% per year during that period (van Vuuren, D. P. et al. 2011). In 2012, the latest year for which comprehensive data is available, international shipping accounted for about 800 Mt CO2 emissions, which corresponds to 2.2% of global man-made emissions (IMO 2015). Figure 1 shows the historical emission development and different projections up to 2050. The projections are based on a new study submitted to MEPC 71 (CE Delft & Lee 2017). The study shows that without further measures to address the GHG emissions of shipping, they will increase from 800 Mt in 2012 to 1,000–1,800 Mt in 2050 in long-term socio-economic scenarios that are compatible with the Paris Agreement goals. If the Paris Agreement goals are not met globally, emissions could increase to up to 2,500 Mt in 2050 because, amongst other things, there will be more transport of fossil fuels. Technological and operational improvements have a potential to reduce CO2 emissions by approx. 33% in 2050 (IMO 2015). If the world at large followed an emissions trajectory compatible with the Paris Agreement but emissions from international maritime transport were to increase as forecast, the maritime sector would use up 17% of the global carbon emissions budget in 2050 (Cames et al. 2015). 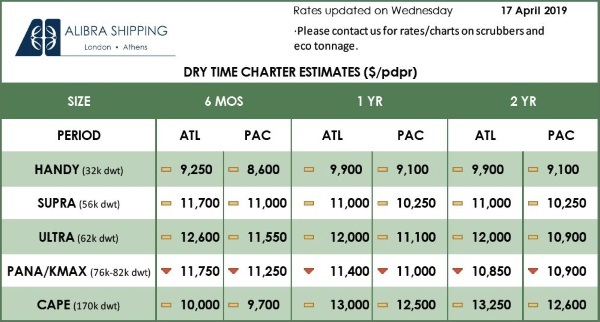 Notes: The projections are based on the expected demand for international shipping under the different economic scenarios and do not consider emission budgets. The green line shows a pathway for the shipping sector that would be compatible with the Paris Agreement (see Cames et al. 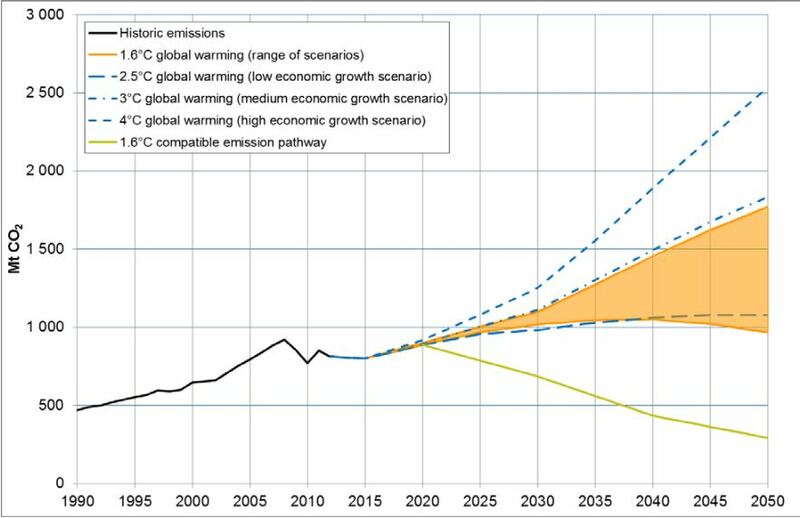 2015, the pathway shown here is based on constant share of RCP 2.6 CO2 emissions). • Agenda item 7, Reduction of GHG emissions from ships, will cover the development of the GHG reduction strategy. • Agenda item 5, Air pollution and energy efficiency, will tackle, among other issues, technical aspects with regards to the EEDI. • Agenda item 6, Further technical and operational measures for enhancing the energy efficiency of international shipping, will cover the discussion on the IMO Data Collection System (DCS). • Agenda item 11, Development of measures to reduce risks of use and carriage of heavy fuel oil as fuel by ships in Arctic waters, will address the discussion on the [potential] HFO ban on arctic routes and the potential uptake ban of such fuels. The subsections below discuss the submissions for the above-mentioned agenda items 7, 6 and 11 in more detail. Agenda item 5 includes, among other items, documents with regard to the EEDI. Among other documents, it mainly includes information provided by the Secretariat and a report of the respective Correspondence Group and is therefore not elaborated in more detail in this briefing. At MEPC 70 IMO parties approved a Roadmap for developing a comprehensive IMO strategy on reduction of GHG emissions from ships, which aims at the adoption of an initial GHG reduction strategy at MEPC 72 and the adoption of the revised strategy at MEPC 80 (spring 2023). From 23 to 27 October 2017 the ISWG-GHG held it second meeting chaired by Mr. Sveinung Oftedal (Norway) in London. Based on a structure agreed at the first session and submissions by Parties and observers, the chair tabled suggestions for draft text for each section of the structure. These suggestions were discussed by the ISWG-GHG and as a result the chair was mandated to develop a draft negotiation text as a basis for discussion at the third meeting of the ISWG-GHG. The plan is to further develop the draft text contained in ISWG-GHG 3/2 dated 15 January 2018 towards an initial GHG reduction strategy by the end of the ISWGHG’s third meeting with a view to discussing any remaining issues, if necessary, and to formally adopting the strategy at MEPC 72. • Chapter 2 on Vision is comparatively short (just 2 lines) but currently includes the chair’s suggestion that the IMO should commit to phase out GHG emissions to zero by 2075. • Chapter 3 on Levels of ambition (LoA) and guiding principles includes a package of four targets: strengthening the Energy Efficiency Design Index (.1), fleet-average carbon intensity targets for 2030 and 2050 (.2), establishing 2008 emissions as a peak which should not be exceeded (.3) and an absolute emission target for CO2 emissions from international shipping for a future year (.4). Some of these options include square brackets, particular around years and reduction figures, indicating that further discussion in the ISWG-GHG or during the MEPC will be required. 4 PE 618.983 on Small Islands Developing States (SIDSs) and Least Developing Countries (LDCs) need to be considered in the IMO’s strategic GHG reduction plan. • Chapter 4 on a List of candidate short-, mid- and long-term further measures with possible timelines and their impacts on states contains a list of potential measures and supportive action for inclusion in the initial strategy. The short-term measures comprise further improvement of the EEDI and SEEMP (.1), technical and operational measures for both new and existing ships (.2), establishment of an Existing Fleet Improvement Programme (.3), speed reduction measures (.4), and measures to address methane and Volatile Organic Compounds (VOC) emissions (.5). 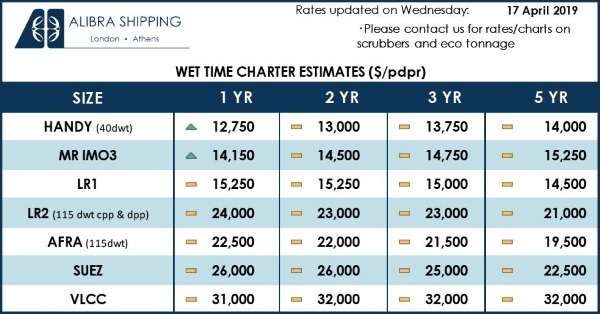 The mid-term measures are geared to increasing the use of low- or zero-carbon fuels (.1), operational efficiency measures for new and existing ships (.2), and innovative emission reduction measures, possibly including Market-based Measures (MBM) (.3). The long-term measures cover the provision of zero-carbon or fossil-free fuels (.1), and fostering the adoption of innovative reduction mechanism(s) (.2). Moreover, the chapter contains a section on the Impacts on States including a list of aspects which should be evaluated before adoption of measures, as well as a proposal of how impacts could be addressed. • Chapter 6 concentrates on Follow-up actions towards the development of the revised strategy, which will lay down the workplan for the next five years. The current version of the text does not contain a workplan, as a result of which there is a risk that the Strategy will not lead to the adoption of any measures in the coming years. To counter that risk, several EU Member States, together with Pacific Island States, have submitted a draft workplan. Canada and Norway have made similar proposals. In total, 26 documents have been submitted by Parties and observers either under ISWG GHG agenda item 2 or under MEPC 72 agenda item 7, two of which have been submitted to both bodies. Several submissions to the ISWG GHG suggest textual changes of the chair’s draft text or comment on other submissions. EU Member States have submitted one document together with Kiribati, the Marshall Islands and New Zealand. In addition, France has submitted with the Marshall Islands the “Tony de Brum” Declaration. Table 1 (view PDF attached) provides an overview of these documents and summarises the main issues of each document. • Vision: None of the submissions explicitly supports the chair’s suggestion to phase out GHG emissions completely by 2075. Several Parties (China, the Republic of Korea, Panama, Belgium et al.) suggest replacing 2075 with “as soon as possible in this century” or “in the second half of this century”. Belgium et al. intend bringing forward the year of decarbonisation by replacing it with “as soon as possible”; they also want to maintain the reference to zero GHG emissions while Panama would prefer to extend the time frame for achieving the target beyond 2075 and also suggests deleting the reference to zero GHG emissions. In contrast, Kiribati et al. want to aim at decarbonizing international shipping by 2050 and request including a reference to the below 1.5°C goal in the Vision chapter. • Level of ambition: Positions diverge with regard to the suggested metrics, to the time horizon, to target values and to when the decision should be taken by. An efficiency or carbon intensity metric is supported by China, the Republic of Korea as well as Argentina et al. while Kiribati et al. prefer absolute reduction targets for the entire sector. Belgium et al. as well as Japan suggest a package of metrics for the LoA that is composed of an efficiency target to be achieved by 2030 and an aggregate reduction target by 2050 or 2060, respectively. Norway suggests adopting only a long-term LoA (2050) but does not support setting intermediate goals while the Republic of Korea, Kiribati et al., Belgium et al. and Japan favour interim targets. China suggests determining an LoA for 2030 only. The LoA values for aggregated sectoral emission reduction range from -100% by 2050 (Kiribati et. al) to -50% by 2060 (Japan). Several Parties (Norway, China) highlight that the LoA should be based on the reduction potential within the shipping sector rather than on a proportional contribution of shipping to global efforts. With regard to the question of when the LoA should be determined China, Panama, Argentina et al. do not think that such a decision should be taken until the results of the DCS are available, i.e. around 2023. Norway, Kiribati et al., Belgium et al. as well as Canada and New Zealand stress, by contrast, that any delay must be avoided because it would require more drastic emission reductions in the future. • Guiding principles: The discussion has focused to date on whether the Strategy should be developed on the basis of No More Favourable Treatment (NMFT), as is common in IMO or on the basis of Common but Differentiated Responsibilities and Respective Capabilities (CBDR&RC), as is common under the UNFCCC. The chair’s text makes reference to both principles and adds that the impacts of measures, in particular on LDCs and SIDSs, need to be considered. None of the submissions explicitly stresses the importance of the CBDR&RC principle. However, China suggests including a reference to the principles of the UNFCCC and the Paris Agreement in the Vision chapter in which its relevance may implicitly be emphasised. On the contrary, Belgium et al. underscore the importance that the strategy is based on the NMFT principle. The Republic of Korea restates its proposed compromise that NMFT should apply to all ships and CBDR&RC should be reflected in support actions. • Candidate Measures: The positions of the Parties still vary considerably in respect of which measures and instruments are most effective or favourable. Chile and Peru claim that speed limits would disadvantage their economies disproportionately due to their longer distance from markets. Norway, for example, supports operational and technical measures and suggests the development of new/innovative mechanism(s). Canada promotes early actions, focusing initially on speed reduction and operational efficiency, and suggests encouraging R&D on zero-carbon fuels because their development will require more time. Moreover, Parties diverge in their view on when measures and instruments should come into effect. Panama as well as Argentina et al. stress that particularly binding instruments should apply only after the review of the initial strategy in 2023. Kiribati et al., Canada and New Zealand as well as Norway highlight, in contrast, the importance of early actions and suggest that actions to reduce international shipping’s GHG emissions should be taken as soon as possible. The positions of parties are clearly still somewhat divergent in many issues. However, they also seem to have emerged in some aspects, for example with regard to the guiding principle, so that it is conceivable that an agreement on IMO’s initial strategy can be agreed upon at MEPC 72. • The EU MRV requires ships to submit data on voyages to and from EU ports, whereas the DCS is global in nature. • The DCS requires ships to report to their flag state, which will verify the data, whereas under the EU MRV shipping companies have to submit a report to the European Commission that has been verified by an independent, accredited third party. • The DCS requires ships to report transport work proxies such as dwt-miles, whereas the EU MRV requires ships to report actual cargo carried. Regarding the DCS, 6 papers, including 1 information paper, have been submitted to MEPC 72. These submissions will not significantly change the regulation, the type of data collected or any of the differences between the DCS and the EU MRV. Table 2 (view PDF attached) provides an overview of these documents and summarises the main issues of each document. Since August 2011, the carriage in bulk as cargo or carriage and use as fuel of heavy fuel oil has been banned in the Antarctic Area (MARPOL Annex I, chapter 9). The Polar Code (in force since January 2017) prohibits in the waters surrounding the two poles the discharge of oil or oily mixtures from any ship into the sea and sets structural requirements to category A and B ships constructed on or after 1 January 2017, but a ban comparable to the one in the Antarctic Area has not been implemented in the Arctic yet. • An oil spill could have severe impacts on marine and coastal ecosystems and could also endanger Arctic indigenous food security (oil spills are difficult to clean up due to harsh conditions and darkness); oil has a slow rate of degradation, especially in colder regions; lack of infrastructure to respond to the spill. • The global warming effect and health effect of black carbon emissions (BC emissions are expected to be higher for HFO than for other fuels). Due to the 2020 global sulphur cap, use of distillate fuels is expected to rise, but since ship activity in the Arctic is also expected to increase as ice dwindles, the use of HFO might still rise. Ten documents including three information papers and seven submissions to MEPC 72 relate to a potential HFO ban and show divergent views amongst the submitters. Finland et al. suggest establishing a ban on the use and carriage of HFO as fuel on ships in Arctic waters by the end of 2021. This suggestion is supported by the Clean Shipping Coalition (CSC) and other NGOs which highlight that a similar ban for the Antarctica Area became effective in 2011. The Russian Federation does not explicitly reject a ban on HFO but clearly prefers other measures to reduce the risks of HFO spills. The Submission of Canada and the Marshall Islands and the submission of CLIA request that possible economic impacts of a HFO ban on Arctic communities must be considered and that clarifications regarding the definition of “Artic waters” and “Heavy Fuel Oil” and with regard to the availability of fuels are required for the implementation of a HFO ban. Table 3 (view PDF attached) provides an overview of these documents and summarises the main issues of each document. As a result of the discussion under this agenda item the MEPC may provide instructions to the Sub-Committee on Pollution Prevention and Response (PPR) to start work on concrete proposals of which type of measures should be developed. 4. what measures will be taken when and which need further examination. Even though it appears that positions related to the IMO strategy have converged since MEPC 71 in terms of structure and content, there is still a considerable gap with respect to some positions on fundamental issues. However, it would be detrimental for IMO’s efforts to address GHG emissions from international shipping if these gaps in position cannot be closed during MEPC 72. The ENVI delegation could aim to convey to key Parties the position of the European Parliament (2018), including conditions under which it would consider calling for regional measures. In addition to the subjects mentioned in the table, the ENVI delegation may want to use the opportunity to discuss how parties view the relation between the EU MRV and the IMO DCS.